Since prophylaxis reduced the incidence of VTE in trauma, the DVT prophylaxis guideline became a standard of care. The commonly used guideline is from the American College of Chest Physicians (ACCP) which is now in the 9th edition. 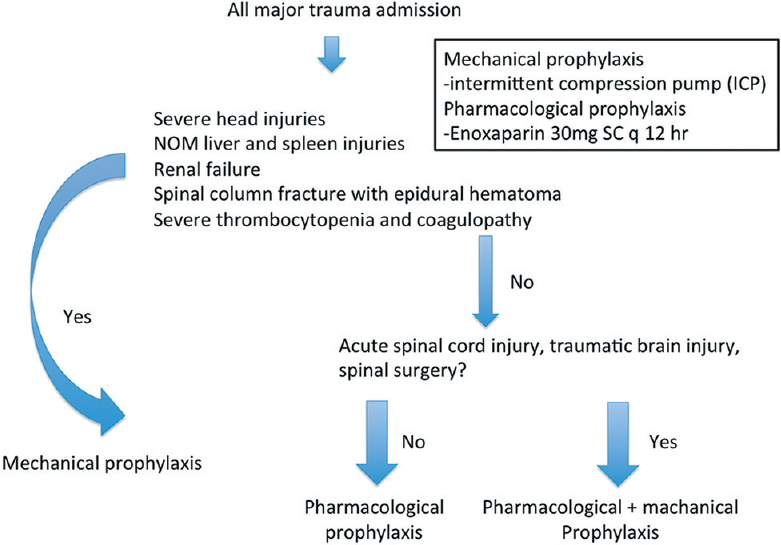 The guideline recommends pharmacological prophylaxis in major trauma patients and additional mechanical prophylaxis in acute spinal cord injury, traumatic brain injury, and spinal surgery for trauma. For patients who have contraindications for pharmacological prophylaxis, mechanical prophylaxis such as an intermittent compression pump is preferable over no prophylaxis. Although the guideline has been available for decades, adherence to the guideline varies among countries. The ENDORSE study surveyed VTE prophylaxis worldwide and found that only 0.2% of at-risk surgical patients in Thailand received a proper prophylaxis according to the 2004 ACCP guideline. Since the ENDORSE study, no data on the adherence to the DVT prophylaxis guideline in Thailand are available. This study aimed to investigate the adherence to the current DVT prophylaxis guideline in trauma patients at a Level 1 trauma center in Thailand. This is a retrospective review from a prospectively collected trauma registry of hospitalized trauma patients who were admitted in Songklanagarind Hospital that was a Level 1 trauma center in Thailand between January and December 2013. The study included only adult trauma patients defined as age ≥ 15 years old, major trauma patients identified as ISS ≥9, and all patients were hospitalized ≥7 days. Adherence to the guideline was the primary outcome. The patients were categorized into three groups according to the hospital guideline that was adapted from the ACCP guideline that classified patients by the risk of DVT and bleeding risk. The guideline of DVT prophylaxis is illustrated in [Figure 1]. The patients who had severe head injury with a Glasgow Coma Scale score ≤8, nonoperative management of solid organ injuries, renal failure, spinal column fracture with epidural hematoma, thrombocytopenia, and coagulopathy were classified in the “high risk of bleeding” group. The patients who had traumatic brain injury, spinal column injury, and acute spinal cord injury were classified in the “very high risk of DVT” group. Other patients were classified in “high risk of DVT” group. Adherence to the guideline was defined as patients who received a prophylaxis according to the guideline beginning at any time after admission. The date and type of prophylaxis and VTE were also collected. The VTE occurrences were only symptomatic cases who had radiographic confirmation or concomitant findings from computed tomography (CT) of the abdomen for follow-up of intra-abdominal injuries. Screening was not done routinely. Continuous data are expressed as mean and standard deviation or median and interquartile range. Categorical data are expressed as frequency and percentages. Kruskal–Wallis rank test was used to compare the means between the three groups, and the Chi-square test was used to compare proportions. P < 0.05 was considered as statistically significant different. Between January and December 2013, 352 patients met the inclusion criteria. The median age was 36 years and the median ISS was 17. Motorcycle crash (38%) was the most common mechanism of trauma. There were 116 patients in the “very high risk of DVT” group, 103 patients in the “high risk of DVT” group, and 133 patients in the “high risk of bleeding” group. The demographic data are shown in [Table 1]. The overall adherence to the guideline was 28.9%. Six (5.2%) of the 116 patients in the “very high risk of DVT” group had both pharmacological and mechanical prophylaxes according to the guideline. The median time to start the mechanical prophylaxis was on the admission day, and the median time to start pharmacological prophylaxis was on the 3rd day of admission. Nineteen (18.4%) of 103 patients in the “high risk of DVT” received a pharmacological prophylaxis which adhered to the guideline. The patients in this group received mechanical prophylaxis on the 1st day after admission and pharmacological prophylaxis on the 3rd day after admission. Seventy-seven (57.9%) of 133 patients (57.9%) in the “high risk of bleeding” group received mechanical prophylaxis during admission which adhered to the guideline, and the median time to start was on the day of admission. The patients in this group also received pharmacological prophylaxis, but it started later than the other groups; the median time to start was the 8th day after admission. There were 11 VTE occurrences in 10 patients (2.8%). One of them had DVT and developed PE later. Among the ten patients, one patient was in the “high risk of DVT” group and nine patients were in the “high risk of bleeding” group. A summary of the results is shown in [Table 2]. Among those patients who had VTE, 5 of 10 had received blood transfusions >4 units before the VTE occurrence. One patient previously had femoral venous catheterization, and one patient was obese. Most of the patients who had traumatic brain injury and solid organ injury did not receive any prophylaxis. The characteristics of the patients and the modality of prevention are shown in [Table 3]. The rate of VTE prophylaxis in this study was much higher than a previous study. The ENDORSE study reported that an international survey found that 0.2% of surgical patients in Thailand received a prophylaxis according to the ACCP guideline. Wilasrusmee et al. 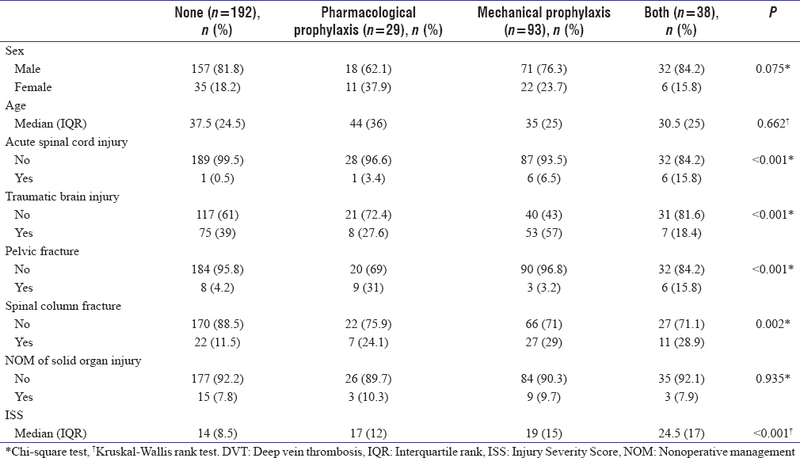 conducted a cohort study from 2005 to 2006 to determine the incidence of DVT in critically ill surgical patients, but there was no DVT prophylaxis in their study and only 1% of the population was trauma patients. Another cohort study was done in a surgical intensive care unit for the incidence of DVT, but no DVT prophylaxis was used. The overall rate of adherence to the guideline was between 28.9% in our study which represented a big leap for DVT prophylaxis awareness in Thailand. The “very high risk of DVT” group had the lowest adherence rate to the guideline since this group needed dual prophylaxes to complete the guideline. This group also had fewer patients who received a pharmacological prophylaxis. The explanation was the patients in this group were more severe which was indicated by the high ISS that possibly caused reluctance of the physicians to start a pharmacological prophylaxis. The “high risk of bleeding” group had the highest ISS, but the guideline required only a mechanical prophylaxis which caused this group to have the highest adherence. Only few studies reported the incidence of VTE in trauma in Asian population. A study by Wong et al. in Singapore reported the incidence of VTE in trauma patients. The study reported VTE incidences of 0.39% and 0.15% of PE during a 10-year period. The incidence of VTE in our study was 2.84%, which was almost ten times higher. These two studies reported only symptomatic VTE in major trauma patients. The explanation of the huge difference may be that our patients underwent follow-up CT scan. The study from Wong et al. collected data from 1998 to 2007 while this study was in 2013. Another study from Prichayudh et al. performed DVT screening in a surgical intensive care unit in which 12% of the population was trauma patients; the study reported the incidence of DVT at 3.6% which was close to our study. Most of the VTE occurrences were in the “high risk of bleeding” group. Since this group initially had contraindications for the pharmacological prophylaxis, it was started only after no contraindications were observed. Therefore, pharmacological prophylaxis was initiated on the 8th day after admission. This confirms the importance of timing to initiate a pharmacological prophylaxis which should be as soon as possible. The interesting finding in this study was 50% of the patients who had VTE and had a history of blood transfusions >4 units. Blood transfusion was reported as a risk factor of VTE in a postoperative setting,, but it was inconclusive in trauma setting. However, the VTE occurrence in this study was too low to make a conclusion that a blood transfusion >4 units was a risk factor for VTE in trauma. The limitation of this study is the exclusion of patients who were hospitalized <7 days which caused a loss of cases who were discharged early or died within a week. However, the cases who were discharged within a week after admission were mostly minor trauma patients who possibly did not need a prophylaxis. The strength of the study is that the data were collected from a trauma registry which routinely collected prospective data. This study also reported the incidence of VTE in trauma in an Asian population which was rarely reported in the current evidence. In conclusion, compliance to DVT prophylaxis treatment in Thailand has improved over time. This research was funded by Faculty of Medicine, Prince of Songkla University, Thailand. Heit JA, Silverstein MD, Mohr DN, Petterson TM, O'Fallon WM, Melton LJ 3rd. Risk factors for deep vein thrombosis and pulmonary embolism: A population-based case-control study. Arch Intern Med 2000;160:809-15. Geerts WH, Code KI, Jay RM, Chen E, Szalai JP. A prospective study of venous thromboembolism after major trauma. N Engl J Med 1994;331:1601-6. Geerts WH, Jay RM, Code KI, Chen E, Szalai JP, Saibil EA, et al. Acomparison of low-dose heparin with low-molecular-weight heparin as prophylaxis against venous thromboembolism after major trauma. N Engl J Med 1996;335:701-7. Norwood SH, McAuley CE, Berne JD, Vallina VL, Kerns DB, Grahm TW, et al. Apotentially expanded role for enoxaparin in preventing venous thromboembolism in high risk blunt trauma patients. J Am Coll Surg 2001;192:161-7. Gould MK, Garcia DA, Wren SM, Karanicolas PJ, Arcelus JI, Heit JA, et al. Prevention of VTE in nonorthopedic surgical patients: Antithrombotic Therapy and Prevention of Thrombosis, 9th ed: American College of Chest Physicians Evidence-Based Clinical Practice Guidelines. Chest 2012;141:e227S-77S. Wilasrusmee C, Kiranantawat K, Horsirimanont S, Lertsithichai P, Reodecha P, Soonthonkit Y, et al. Deep venous thrombosis in surgical Intensive Care Unit: Prevalence and risk factors. Asian J Surg 2009;32:85-8. Prichayudh S, Tumkosit M, Sriussadaporn S, Samorn P, Pak-art R, Sriussadaporn S, et al. Incidence and associated factors of deep vein thrombosis in Thai surgical ICU patients without chemoprophylaxis: One year study. J Med Assoc Thai 2015;98:472-8. Wong TH, Koh MP, Ng J. Symptomatic venous thromboembolism in Asian major trauma patients: Incidence, presentation and risk factors. Eur J Trauma Emerg Surg 2013;39:495-500. Gangireddy C, Rectenwald JR, Upchurch GR, Wakefield TW, Khuri S, Henderson WG, et al. Risk factors and clinical impact of postoperative symptomatic venous thromboembolism. J Vasc Surg 2007;45:335-41. Xenos ES, Vargas HD, Davenport DL. Association of blood transfusion and venous thromboembolism after colorectal cancer resection. Thromb Res 2012;129:568-72.